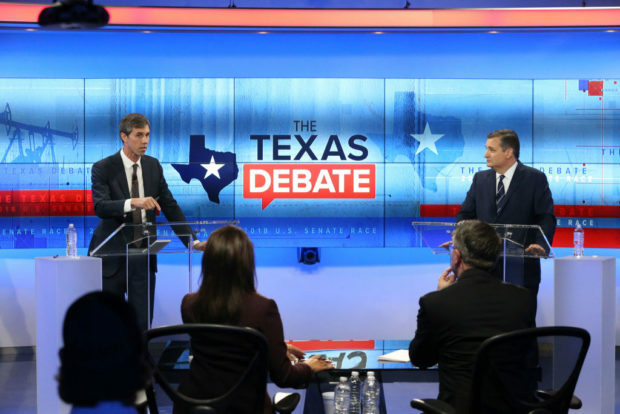 Texas Senator Ted Cruz responded to his challenger Rep. Beto O’Rourke calling him a liar during his appearance on the “Ingraham Angle” on Thursday night. “Well you can see the desperation in that debate where he was insulting me, he was attacking me, he called me a liar. What’s striking is what he was responding to when he screamed liar. I pointed out that he voted in favor of a $10 a barrel tax on every barrel of oil produced in the state of Texas. And his response is not to engage in substance but simply scream, liar, liar, liar,” Cruz responded. “Well, you know, facts matter, and we put up on our website tedcruz.org the exact text of the resolution that Congressman O’Rourke voted on,” he continued. “President Obama proposed a $10 a barrel tax on oil. Congress — the House of Representatives brought up a resolution saying, we don’t want a $10 tax on every barrel of oil and O’Rourke voted no.” RELATED: O’Rourke Addresses ‘Beto’ Nickname After Student Cites Donald Trump Jr.
Cruz leads O’Rourke by seven points, according to a CNN poll of likely voters released on Tuesday.